French President Francois Hollande has appointed his former partner, Segolene Royal, to the cabinet, two months after separating from his official partner, Valerie Trierweiler, following reports of his affair with an actress, Julie Gayet. BBC News profiles the women in the life of the man at the helm of the EU's second-biggest economy. Ms Royal, a prominent French Socialist who ran for president in 2007, has been appointed to the post of energy and environment minister. She has had four children, now adults, with Mr Hollande. Although never married, the two were together for about three decades. They met at a university party and were once regarded as a power couple, both harbouring ambitions for the country's highest office. Ms Royal, 60, made history in the 2007 election as the first woman in France to be nominated for the presidency by a major party. 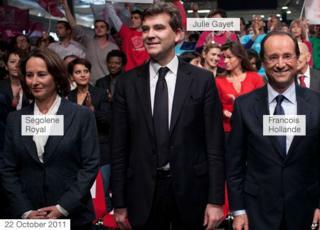 She lost the contest to Nicolas Sarkozy, and officially separated from Mr Hollande soon after. Ms Royal's inclusion in the latest cabinet concludes a long spell on the political sidelines for a woman whose ministerial experience dates to the time of the former President, Francois Mitterrand. She was left out of the first cabinet formed by Mr Hollande following his election to the presidency in May 2012, reportedly because of hostility from his partner at the time, Ms Trierweiler. Mr Hollande did not deny a report in January that he was having a relationship with Ms Gayet, an actress, while he was officially the partner of Ms Trierweiler. However, he did hit out at what he described as an invasion of privacy. French gossip magazine Closer published claims of an affair going back two years, which would pre-date his election as president. The magazine showed photographs of Mr Hollande and Ms Gayet arriving separately at an apartment. The couple were also alleged to have snatched weekends together in the south of France. Mr Hollande is said to have made excuses to avoid a holiday in Greece last year with Ms Trierweiler, so he could travel instead to his Correze constituency with Ms Gayet. In March, a French court ordered Closer to pay Ms Gayet 15,000 euros (£12,000) over a breach of privacy for revealing the affair. The payout was far lower than the 50,000 euros the actress had sought. Ms Gayet, a 41-year-old actress, is fairly well known in France, if not internationally. She once appeared in one of Mr Hollande's election campaign adverts on television. In that video (in French), she described him as "a humble man," who "really listens". Ms Gayet played a leading role in Quai d'Orsay, a 2013 satirical film centred on the French foreign ministry. Her filmography also includes the titles Shall We Kiss? and My Best Friend among dozens of others. She is the daughter of a wealthy surgeon and has had two children with her former husband, the Argentine-born film director and scriptwriter Santiago Amigorena in 2003. Ms Trierweiler and Mr Hollande parted company in January. Until then, the president's official partner had her publicly funded staff and office, and lived in a wing of the palace. She was taken to hospital "for rest and some tests" following Closer's scoop. A friend was quoted by French magazine Le Point as saying she had taken "one pill too many", but denied it was a suicide attempt. Ms Trierweiler, 48, is a journalist who writes for Paris Match magazine and has presented discussion programmes on French television. She moved in with Mr Hollande after his official separation from Ms Royal in 2007, and was divorced from her own husband, with whom she has three children. She controversially took to Twitter in June 2012 to back an opponent of Ms Royal in parliamentary elections. She subsequently apologised for her comments, saying: "I had not yet realised that I was no longer a simple citizen." Mr Hollande's son Thomas, by his previous relationship with Segolene Royal, said in the wake of the incident that he and his siblings no longer wanted to see Ms Trierweiler. Last summer, she won damages of 10,000 euros (£8,300; $13,600) from the authors of a book entitled The Troublemaker, which made allegations about her private life. Closer and two other magazines, Voici and Public, were fined by a Paris court in October 2012 for publishing photos of Ms Trierweiler in a bikini.